Brian Villa a down trodden ordinary man wants more from his life. The only problem is that he’s about to get it! Sensing his thoughts, the enigmatic life force known only as The Infinium, seizes Brian from earth and propels him to the center of the universe to the planet Durdara to participate in the greatest galactic gladiatorial blood sport ever assembled; In order to fight for sole possession of the most loved, feared, and enigmatic power in the Universe. Brian Villa an unwilling participant and devoted pacifist, neither craves this power nor does he wish to participate in any form of mortal combat. His only desire is to return home, and in order to fulfill that wish Brian must not only break a solemn vow of non-aggression, but battle to the death against some of the fiercest warriors ever gathered in the known galaxies in order to fulfill a destiny that he craves nothing of. What Brian doesn’t realize is that the Infinium did not choose him for his abilities, rather he was chosen for his nobilities. 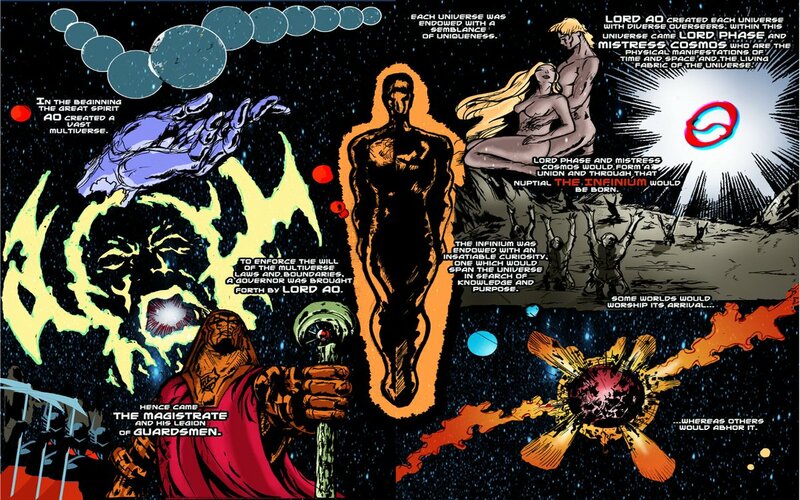 Join us as we take you through a cosmic odyssey of epic proportion where one man’s wish for purpose will propel him toward an unfathomable quest to become a god! To the victor comes immortality, to the vanquished oblivion. Brian Villa is a young man with a dark past and a bright future. Like many, he’s had tough times and challenges to overcome to varying degrees of success. With a talent for engineering, Brian had put his past behind him, overcoming his troubles and discovering happiness in family with wife Kelly and their first child. Unfortunately, Life wasn’t quite through with Brian. As the economy fell out from under him, he lost his job and was forced to move his family back to his hometown where he took up work as an auto mechanic. Things were tight, but with his family beside him Brian continued to think about their future. Everything changed as Brian found himself pondering his potential, as people often do. He wondered if there were more to life, things that he could be doing to make a greater difference in the world around him. What Brian couldn’t have predicted was that someone was listening and prepared to grant him both a direct answer and an opportunity to seize the day. 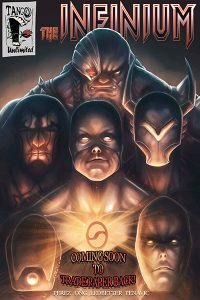 Brian is transported to a far corner of the universe, where a sentient power known as the Infinium has gathered a collection of beings sharing one common trait- the desire to push past their present circumstances, to fully reach their potential and discover what the universe could hold for them. Brian and the rest of his fellow potentials will have to battle it out, competing for the ultimate prize- to join with the Infinium and wield its unbelievable cosmic power. While most of his opponents are all too eager to compete for this honor, Brian finds himself at a crossroads with a difficult choice to make. His checkered past had been full of violence and regret, resulting in his decision to live a life of pacifism. How long will Brian’s ideology survive in the face of near-certain doom? More to the point, will he be able to hold onto those principles if resorting to violent action is what it takes to return him to his family? This collected edition of The Infinium was a long time coming, percolating in the brain of Rich Perez since around 2010. Finally, much like his fictional character Brian Villa, Perez has given in and opened himself up to the possibilities of creating something and putting it out into the world. With the help of longtime friend Rage Ledbetter, artists Ron Ong & Karlo Reyes, and the encouragement of his family, Infinium has been put to the page… and by all accounts it’s done pretty well for itself. Well enough to warrant the marketing of a collected trade edition, gathering the entire six issue opus together into one volume, with plenty of bonus content to boot. As a comicbook critic, it would have to be said that Infinium may not be a perfect piece of work. Thankfully, I don’t consider myself a critic, or at least not a very good one… I’m just a reader of comics who likes to run his mouth about them. With everything else this title has going for it, I had no problem at all ignoring the glicks and glucks that came from a group of new creators putting together a labor of love, and just enjoying the hell out of the story and artwork. 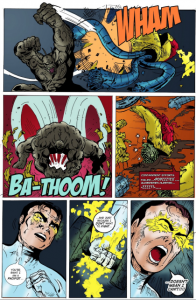 Rich Perez has created a throwback story that fans of old sci fi titles- books like Dreadstar (a personal favorite of mine), the original Guardians of the Galaxy, and events like Secret Wars and the Infinity Gauntlet- can really get into. 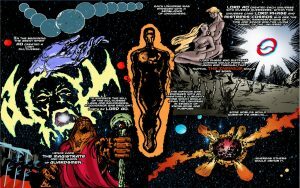 It has that old spirit that sucked a lot of people, myself included, into the comic titles that embraced conflict and action on a cosmic scale. Infinium was just a lot of fun to read. What’s more, it was kinda cool to be able to sit down and read Perez’s story from start to finish, taking note of the improvements he made in his work as he went. Likewise, the artistic team on The Infinium has done their part to bring together a piece of work that’s impressive just for the fact that it’s a first-time effort from a group of friends and lovers of comics. The artwork by Ron Ong, handling pencils and inks through the majority of the series, starts off looking solid and grows from there. Ong has a good grasp of perspective and movement, with few of the problems experienced by new artists contributing to a project of this size and scope. His action scenes have a good sense of movement, without much of the choppy looking action or awkward poses found in some independent titles. And as the series progresses his layouts can be seen to improve by leaps and bounds as he expands his skillset. It seemed like, as he grew more comfortable in his work, he let himself experiment a bit, particularly in his panel arrangements. Without a doubt, the rest of the artistic team tackled this project with gusto. Rage Ledbetter’s work in colors straddles the boundary between traditional comics with a strictly two dimensional appearance, and more detailed shading that brings depth to the pages. Also, some of the issues have been remastered from their original versions, and extra content has been added for this omnibus. For the newly added backstory on Brian Villa, Karlos Reyes handled the art and brought his own style to the growing (hopefully continuing) Infinium mythos. 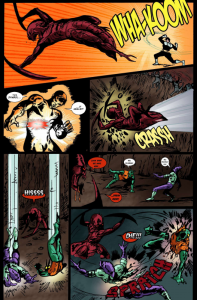 In the end, The Infinium is a worthy addition to any comic fan’s reading list. How many of us have, over the years, considered the possibility of creating something of our own, of putting pen to paper and adding our footprint to the medium we love? Well here’s a group of people who did that very thing, and the end result is something that deserves a little notice and appreciation. It may not be from one of the Big Two publishers, but it reads a lot like what they used to be. I just recently purchased the set of 6 issues from a show they were at. I have to say I agree with you especially on the Dreadstar reference, definitely was a nice throwback feel from the 80’s. Hope they do some more work haven’t seen any of the remastered materials but I will be looking out for it. Glad I’m not the only person who remembers the old Marvel Epic label and the awesome that was Dreadstar… The Infinium could do a lot worse than to go for that old school cosmic feel, and I thought they pulled it off. No doubt about it, this was a “labor of love”.